So, if you have been following me at all on social media for the past week, you would have known that I was attempting to do the Grumpy Grind this weekend. This was an 82 mile gravel grinder. 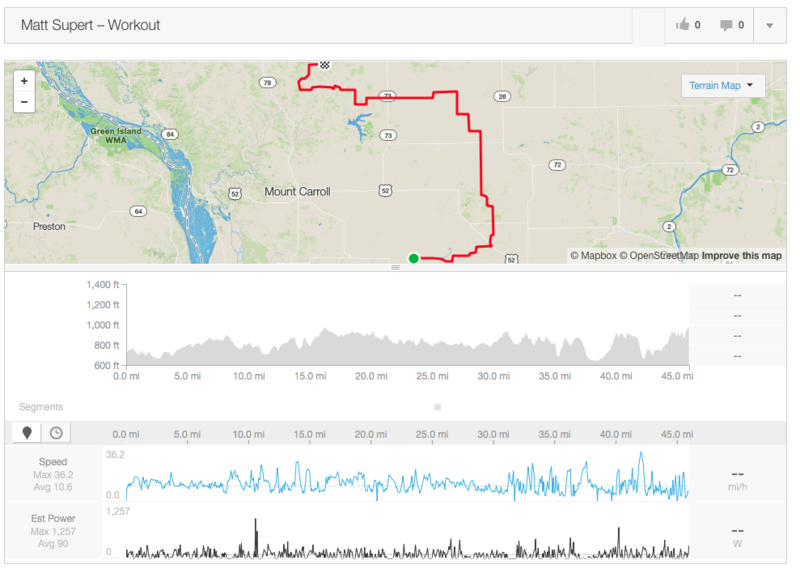 A gravel grinder is a very midwest sort of bike ride that is focused on riding on gravel roads. So for the past month or so leading up to this ride I was preparing myself for some pretty terrible weather. Cold, perhaps raining conditions. What we got instead was a beautiful day. Perhaps a too beautiful one. People were initially joking about how this was the least grumpy of the Grumpy Grinds, but after about 20 miles in I think every found out that the sun and the heat combined with the nearly sand like road conditions made this a very grumpy grind. Road conditions, as I mentioned were brutal. The gravel roads were so dry that they were basically powdered sand with rocks in them. It was extremely difficult to find a path on some of the roads. The most brutal section of the route was on Hershey Road, around the 25 mile mark. This area, as I found out, was a killer for many people on the ride. Both my dad and I decided that we weren't going to be able to finish by here and instead we were going to bail out at the midway point. I wanted to make an effort to try and finish the full first half of the ride and tried to get the last ten miles or so. That ended up being a mistake that was more than I could handle. As soon as I started around that 35th mile I was already beginning to cramp up in my legs. What I didn't know is that what lay in front of me were some of the hardest vertical changes that were to be shown on the ride thus far. As you look at the back half of my graph above, you can see that I hit several elevation changes of over two hundred feet. Well that finally killed me. After stalling out on several hills my legs decided to call it quits. I seized up and literally couldn't walk. I had to then call in Megan to act as my SAG to bail me out. Overall though, this was a great ride. It was brutal, but you don't know if you can't do it until you try. Great people and a great setup overall though. As some of you may know, I have been getting more and more involved into biking over the past couple of years. I am not really into traditional road biking, but some of the longer touring stuff and off road biking definitely interests me. A couple of summers ago I got my old Trek 820 mountain bike out and was doing some trail riding out at the Palos Triangle. Unfortunately due to rain, most of the trails have been closed for a good portion of this past summer. There has been a lot of talk online about Cyclocross riding, which appears to be a big up and coming growth area in the biking sport. Cyclocross is basically offroad biking, but it is structured around a race course that has some defined obstacles on it, which usually include some sections of sand and obstacles that require to you dismount from the bike. The bikes themselves are surprisingly road bike looking. They have drop bars and 700 cc wheels and they are all hard frame. After doing some initial research online it does appear that I don't need to go out and buy a $800+ cyclocross bike and I can in fact use my existing mountain bike for the races. This looks really fun and appealing to me since cyclocross races in the Chicago area are focused around the fall and winter. I have ordered a pair of 26" cyclocross tires for my trek, since it is due for new tires anyways and I am planning on attending an introductory course this weekend to see if this is something that I might find interesting. Hopefully it will be a good time. The video above from the Chicago Cross Cup looks fun, doesn't it? A couple of weeks ago I mentioned in my post "Coming Full Circle on the Bicycle" was in the process of looking for another bicycle to add to my list to do some tour riding with my dad and brother. I have spent the past several weeks doing quite an extensive amount of research on the bike touring world and this past Saturday I went out shopping for bikes. So I spent the better part of five hours on Saturday shopping for a touring bike and I actually ended up with something I totally wasn't expecting, the Novara Safari from REI. I went to three different bike stores and realized that I just couldn't get comfortable on any of the bikes with drop handlebars. I am not sure if my arms are too short or what but I either felt my arms were too far extended or my legs were too bunched up. I then started testing some of the hybrid touring bikes. Trek had some good stuff, but it was just a bit too much money (~$1300) and it actually didn't have all of the braze-ons that I was looking for. The Safari certainly had some good recommendations online, but I certainly would not say that it was one of my top choices initially going into this search. After trying a whole bunch of bikes and riding them around I actually settled on the Safari. The butterfuly handlebars were simply the most comfortable.The bike also has the mounting I was looking for all over it. 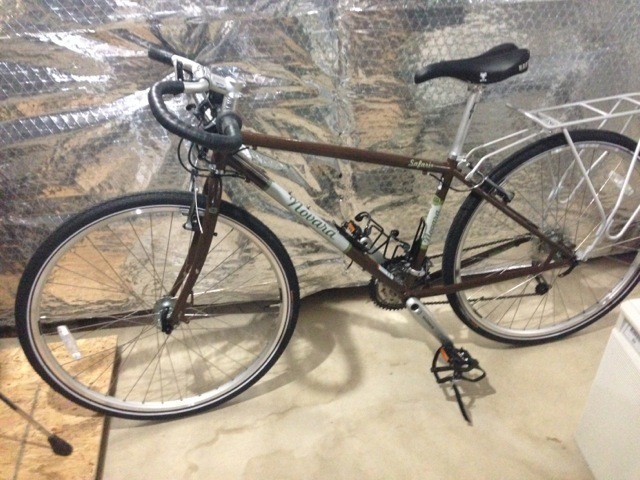 Three spots for water bottles/pumps, mounting points to upgrade to disc brakes, braze-ons for a front pannier. I have to say that I was quite surprised and it was by far the most comfortable of the group to test ride on. The only thing I can see immediately upgrading is the bar tape which has a very plasticy feel. This process has also started some of my research into a ride with my dad and brother. My dad had a great suggestion of riding up to Lake Geneva and then doing a loop back down. That seems like it would be an excellent ride route. It is about 30-40 miles one way up and a good portion of the ride is on trails, which would make for a a good first excursion. I have found that Google Maps (despite its problems) has a really decent route planner for bike riding that highlights a lot of trails. 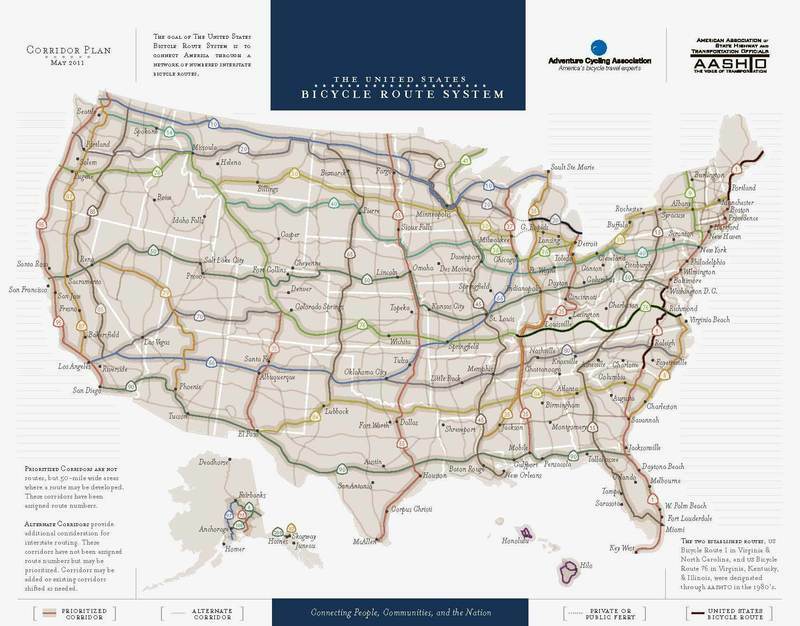 This then of course led me to find out about the US Bike Route system, which appears to be a nationwide designation for trails, routes and roads for bike travel. It looks like the Adventure Cycling Association is working with a variety of state DOT's and other agencies to designate a national bike route system. It looks really cool. I just wish there was a better centralized website that had the routes on it in an interactive map that would help with trip planning.